When most people think of 45 RPM records, they think of the small records often used for jukeboxes and singles. While it's true that many 45's released are singles, there are also 45 RPM LPs out there. These records play at a faster speed than the usual 33 RPMs of a standard LP, and because of this, are often doubles. While on a 33 RPM record, you can fit an entire album's worth of music, 45 RPM LPs can usually only fit about 12-15 minutes of music on each side--usually not enough space for an entire album. So, what's the big idea? It seems like these 45 RPM records are more trouble than they're worth! According to audiophiles, the 45 RPM format sounds better because more musical data is fit into a smaller space than with 33 RPM records. This logic is also applied to digital music formats such as MP3s. A 256kbps MP3 is said to sound better than a 128kbps MP3 because more data is contained in the file. Just like a computer must read through more data in a 256kbps MP3 than with a 128kbps MP3, a turntable stylus must pick up on more nuances and details in the record groove in a 45 RPM record than in a 33 RPM record. Anyway, the album I purchased was one that I had only listened to on CD and MP3 up until a few days ago. I can tell you that it sounds WAAAAY better than the CD, and definitely better than the MP3. However, I don't have a 33 RPM pressing of the album to do a side by side comparison. Too bad... I need to give the album another intense rotation or two to really get a feel for the superiority of the sound over CD, but again, this proves the theory (again) that vinyl really does sound better. If you find an album that you love, and it is available in the 45 RPM format, it's probably worth picking up, because in addition to the theoretically better sound, it is also probably a heavier format, made with virgin vinyl, and may even include some nice extras. Enjoy the music...in 45 RPMs! I am skeptical of die-hard audiophiles who talk about how some piece of gear sounds better because it has .01% less THD. The same argument is made with regards to MP3s (and other stuff too). If you didn’t have the spec sheet in front of you, would you really be able to discern such a small difference? Human ears are not precision instruments, and while it may be true that some humans can perceive smaller nuances in sound than others, it doesn’t mean that an especially perceptive human can make the same judgments as a precision instrument or computer. As for “proving that vinyl is better”, I have proven it to myself, but maybe other people aren’t convinced. That’s fine, because the only person’s opinion that matters when it comes to how something sounds is my own. I encourage you and everyone else that reads this to make up their own minds about what sounds best to them. Anyway, thanks for the comment. I am glad that I’ve got some lively discussion going! why compare cd vs mp3 if they are both bad! Vinyl or 24/96 is another thing. My belief is that audiophile gear sounds better not because it boasts all sorts of good specifications (THD, s/n, slew rate, blah blah, etc), but because most audiophile gear is very high powered, which then allows the listener to enjoy music much louder, with less distortion. With the volume up, you hear those subtle nuances in the sound, plus you get that realism of hearing the music at natural volume levels, making the music sound better. Do you if its possible to have the hole drilled to the old size which use to be standard when buying 45 rpms? It seems that a lot of the vinyl out there is with a smaller spindle which only works on turn tables, but not jukeboxes. It’s possible, but I wouldn’t recommend it. If your hole ends up being off the exact center of the record, it may not play properly, or if it does play, it may introduce distortion into the playback. If you have the tools to do it properly, maybe try it out on a record that you can throw away if it doesn’t work out. Good luck! I’m trying to figure out of the vinyl I bought is 45 or 33. There are only 3 songs per side, which are about 4-5 minutes long each. So that would leave me to believe that it’s a 45. Os there another way I can tell? ( I haven’t played it yet….I would like to know the speed first before I play it). Honestly, the easiest thing to do would be to play it. Although if it’s a full sized LP, it’s mostly likely 33, if it’s a small record with a big hole, it’s probably a 45. If you put the record on and use the 33 RPM setting, and the music sounds natural, it’s probably a 33. If it sounds low-pitched, slow and evil, it’s probably a 45. Conversely, if you put the record on and use the 45 setting, and the music sounds right, it’s probably a 45. If the music sounds fast, high-pitched, trippy, and weird, it’s probably a 33. Good luck! The sound quality of vinyl has more to do with the mastering of the vinyl than with the rotational speed of the record. A good mastering engineer can make both a 33 and 45 version of the album sound good. 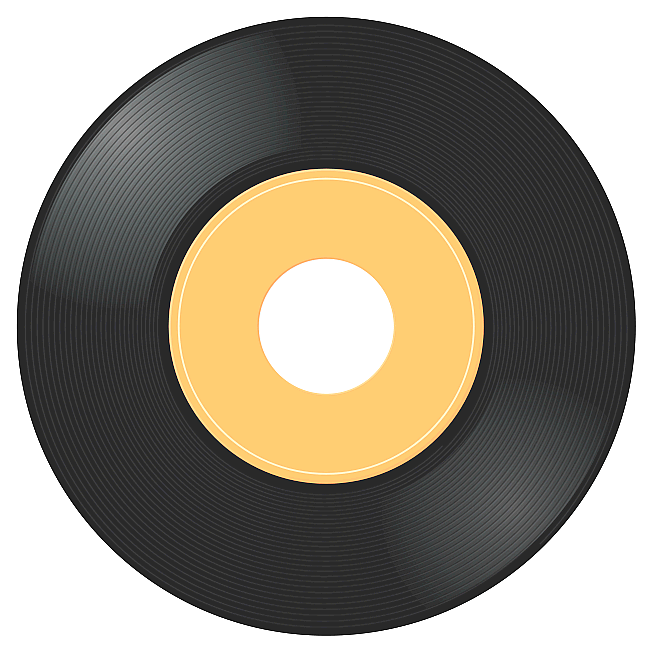 The problem area with a 33 rpm vinyl album is during the second half of a side, as the needle gets closer to the label, there is less land to encode the audio information of the sound, the sound waves get squashed, there is not as much resolution, it gets much more difficult to capture high frequency information without distortion. Lowering the volume of the inner tracks can help them sound better, thus you did tend to find quieter songs as the last songs on the side of an album in the past. Mastering at 45 RPM helps to alleviate this problem, making the second half of the 12″ vinyl side better able to capture audio without having to lower the volume of the songs. It’s really basic physics, 1/2 way into a 45 RPM side is comparable to the outside of the 33 RPM record in terms of the amount of land available to encode information. 1/2 inch from the label, the end of a 45 RPM side, is comparable to the middle of the 33 RPM side, kind of where the physical limitations of the vinyl format start to become audible as distortion. Thus the beauty of a 45 RPM 12″, you have an entire side of useful land to encode audio without having to worry so much about distortion and the physical limitations of the vinyl medium itself. 256kbps MP3s played through a very high-quality listening device, to my ears, are not the same as the CD. 320kbps MP3s seem pretty much the same. 256kbps AAC from iTunes seem pretty much the same. We are talking about my $2600 bi-amped recording studio monitors through a $3500 D/A convertor, to put things in perspective. The average human does not have this type of listening device, I need it for studio work, even I would have a hard time telling the difference if I didn’t have this “audio microscope.” It’s important to note the context, the listening environment, before making blanket statements about sound quality. 24bit/88kHz digital audio, that I work with in my studio, is quite spectacular, and significantly captures the sound of the incoming signal more accurately than CD-quality 16bit/44kHz. The audio CD itself is not the best digital audio storage medium, DVD-A and SACD, are much better equipped to store accurate digital audio and compete with vinyl, if you can find them anywhere, and have the appropriate playback device. Thanks for the info! You do make some good points. To be able to get the best listening experience, there are many more things to consider than the RPM of the record. In addition to the quality of the gear you’re playing back on, there are a million other things: Your position in the listening environment, cleanliness of the stylus or record, ambient noise level, the power output of your amp, even your physical or emotional state. However, in my opinion, all audio formats suffer from the law of diminishing returns. Sure, you could have some crazy high-end digital audio format that contains 1000x more musical data than a regular old 128kbps MP3, but it’s not going to sound 1000x better. I am 42 years old. This past summer, I dug out my Technics turntable from my high school days. Surprisingly, I was still able to buy a new belt, new cartridge, and even a NEW dust cover as the tabs that fit into the hinges were broken in the 80’s. This turntable did not get a LOT of use back then so the motor is top notch. I can accurately adjust the strobe for exact playback. Let me tell you the thoughts that went through my mind after digging out my old 80’s albums out of storage. After listening to a few, I can say the only thought that kept running through my head was “what the hell were we thinking!!??!! These albums DO sound better than the CD’s. Yes, I re-purchased all my vinyl on CD, thank god I never got rid of the vinyl though. To me the better sound quality of vinyl over CD is obvious. One other issue I have NOT seen anyone address is that many albums sound SLOWER (and I must say more natural, like, what I “remembered” from “back then”). Again, it’s NOT my turntable, it’s working flawlessly and to prove the speed issue, I tested this one NEW out of the box turntable, again, the sound on many albums is slower, more natural. I’ve read up on the “loudness wars” where CD recording levels have been pushed up so high that musical information is missing on the CD’s, YES I hear that now, IT’S TRUE!! Sad though, for people like me that replaced all our vinyl with CD’s, then we went CD ONLY, now a lot of this vinyl resurgence is very clever marketing scheme on the part of the music industry (get the teens and 20 somethings hooked on this, something more difficult to copy/pirate/upload) make it cool again, and also maybe those 80’s guys (like me!!) will go out and get all the stuff they bought in the late 80’s, all of the 90’s and early 2000’s, maybe they will go out and re-buy all that stuff on vinyl!!! Pure Genius!! But you know what, I’m NOT buying all that CD stuff on vinyl, what I have I have, but I AM buying any NEW music on Vinyl whenever I can, and I can tell you it’s getting easier and easier, chain stores in my area are starting to stock vinyl now, not just the used record shop on the corner!! Now, for the last part of my ranting on here, if you read some of the articles on the ‘Net about the “loudness wars” another aspect mentioned in those articles is LISTENER FATIGUE. Hmm, I kinda proved this to myself. People are going to call me crazy here but TRY it for yourself if you can. Without a lot of medical history, I have great blood pressure, that of a healthy teenager. When I listen to music with headphones, it’s LOUD, been doing that since my teen days, hearing tests STILL pass with flying colors!! Now, when I listen to anything digital, MP3’s , CD’s etc. I have the volume LOUD. After 15 min. or so, I can feel my pulse throbbing in my neck. To be accurate here, the NEXT day, not mixing the test subject matter on the same day, the NEXT day, I listen to some of my vinyl, also LOUD, pulse in neck is soft as ever. And I have repeated this many many times. Strange? Yes. But I think the guy that wrote that article on the “Loudness Wars” and also went into some way too technical stuff for me to explain but DO understand, his point about the human ear NOT being meant to listen to digital information (even though we know it’s being converted BACK to analogue), that the human ear does better with analogue, he’s on to something here. Again, I challenge anyone to try this, just be sure to do it on separate days, or at least hours apart, dont do back to back tests as you can’t get an accurate result, you need time to let your body re-adjust. Of course, all this got me thinking, what happens when we WATCH digital information on tv? Millions of pixels…… what does that do to our brain? We all know how crappy digital cell phone conversations are when they go choppy, which is very often. I am calling all of this, “The Digital Lie”. We have been force fed digital at a slow to fast growing rate for over 25 years now. Might this have something to do with so many people being MORE stressed now than back then? The increased demands on our eyes, ears and brains?? It is always funny to watch a short, decent presentation of a topic get debated into oblivion. Good job. I think a child’s dream somewhere just died. Oh yeah, and that ultra-rare mint condition record you’ve been searching for…It called, and left a message saying it no longer wants you to own it. As a “part-time” collector of vinyl, and really all formats of music (just depends on how I find them), I can say that as long as there’s a good amp, respectable set of speakers, and something I want to hear that’s good enough. In terms of actual audio that is reproduced from a 33 vs a 45, there is negligible difference but on some truly audiophile equipment that difference may be noticeable – it would, however, be at the fringes of the recording. The sub-freq cut-off range and ultra high-end are more “felt” than heard, in any case, and any “problems” that emerge from reproduction between the two formats will really only become apparent through their harmonic interaction with other elements of the sound in the more “musical” areas of the frequency spectrum. That said, I’m a hip hop producer and spent many hours digging through old, weird records. There is a benefit to sampling from 45s with regard to quality of audio but in my experience it has nothing to do with the reproduction of “encoded” frequencies. The benefit lies in the signal to noise ratio difference between the two formats. Because the process of reproducing sound from vinyl on a regular turntable is a mechanical process, the very fact that the needle drags along a groove means that it picks up surface noise. The older and dirtier that a record becomes the more this surface noise will take the form or white/pink/brown noise. So, why is a 45 record better at dealing with this? Well, because both forms will pick up the same relative density of wear and dust, the only benefit comes in that because the needle travels over a 45 faster, it reproduces that surface noise at higher frequencies, often pushing it out of the audible spectrum of sound. You can try this on any old record to see my point. Take an old, dusty 33 and play it then switch your turntable up to 45, you’ll hear the noise diminish relative to the recorded signal. All in all, it is a bit of a pointless argument. Both formats are massively flawed in terms of accurate reproduction. That is the beauty of a record – it is plagued with harmonic distortion, the brutal RIAA curve implemented imperfectly by solid state and valve technology, surface noise and clicks… that’s why it sounds so warm. I can guarantee you that any slowing is introduced by the turntable, or all in your head. Digital does not speed up audio. There is a noticeable difference between 320 and 128 kbps but its barely noticeable. The audio is clearer and smoother though and the file isn’t as lossy. Of course, vinyl is the highest definition. Can someone inform though as to why a 45 is better than a 33. Makes no sense to me since more audio data can be stored in the same time interval on a 33. This would line up with the 256 vs 128 analogy because the former has a larger file size. Likewise a 33 goes through ~half a revolution per sec. @ 6″ from the center that’s about 21″ of space in the groove per second which goes down steadily of course. A 45 on the other hand is three-quarters of a rev/sec. However the space is only 16.5″/sec (@ 3.5″ from center). Actually, the 45 has more data. Think about it this way: A 45 spins faster than a 33. This means that the stylus will have to read more data in a 45 than a 33. Just like a high kbps MP3 vs. a lower kbps MP3, the computer has to read more data with the high kbps file. Of course, whether or not a 45 actually sounds better to a human ear is something else entirely. There are a number of factors that affect sound quality, many of them have not even been touched in this discussion. However, I just wanted to bring out a couple of points. The first is, “speed” without considering other factors, is not relevant to sound quality, fidelity or any other aural perception. So, when this discussion is speaking of “speed” it is factoring in a great many qualities which are being taken for granted and should not be. The first is “data density”. That is a function of how much data is recorded in a given surface area of vinyl. On a LP, we have an approximate diameter (manufacturers start recordings at different places, so it is not a given number for where the music starts) of 12″. The circumference of that circle would be about 37.7″ at 33 1/3 RPMs, that’s about 1,257 inches of vinyl passing under the stylus per minute. The inner circle where the music stops playing is about 5″, a circumference of about 15.7″ or about 524″ inches of vinyl per minute. So sound density changes by about 42% from the beginning to the end of an LP. A 45 is about 7″ in diameter down to about the same 5″, so at 45rpm, the outer rings has about 990 inched of vinyl down to about 707 inches of vinyl. So a 45 represents some mid-portion of a 33 LP, the outside of a 33 being greater density and the inside being less. That’s what determines the amount of data being available. In a perfect world, more data would mean better sound fidelity. However, that greater density not only allows more “good” data to be recorded, but allows more “bad” data to be recorded and greater chance for picking up noise, distortion and contamination. So, in a real sense, you are just getting more of both. Also impacting quality is groove depth and density. The grooved on a 33 are shallower which provides less fidelity and makes them easier to damage. A 33 also usually has more “grooves per inch”, which actually improves fidelity. As stated previously, as you “spiral in” on a record, the density changes. The faster you spiral in, the easier it is to hear the decreasing density’s impact on sound. So, a 45 echoes that sound more quickly than a 33. All of these things, and many more, impact analog sound quality. Some of those other considerations are wow, flutter, static, pop and environmental factors transferring to the stylus. Digital music suffers from none of those factors. And the data sampling rate (128 versus 256 versus 320 kbps) also is almost meaningless without some context. In a perfect world, all sound in any sampling rate falls inside the limitations of human discernment. However, we don’t live in a perfect world. For that reason, it is important to know the sound density you are sampling. A 12, 16, 24 and 48 bit sound pattern can be transmitted with a frequency response from 2Hz to 30 KHz (the human ear normally only registers things between 50Hz and 20KHz) and transmitted from 12 – 176 KHz. Thus, the volume, speed and frequency of data drastically changes what is sampled and what is captured. For the purpose of illustration, if someone plays an “A” on a piano with no change of pitch, duration or volume, it would have no detectable difference no matter which data rate you chose nor how sophisticated the equipment you used to detect it. If you tried to capture the entire electromagnetic spectrum for, say, FM radio and then play back just your favorite station, the likelihood of you getting acceptable results would be very much dependent upon the sampling rate (and a number of other factors). The capture rate is a function how much data you want or need to capture to produce an undetectable difference in the range of audible hearing. Lossless recording try to capture everything and need a very high capture rate, with a very high bit count, transmitted at a very high frequency. Compressed formats use a clipping format to make sure they cover 80-90% of the audible range, eliminating highs and lows and then sample at a rate that skips periods of time, but tries to do so in a manner that is not audibly discernible. The smaller the file size you seek, the more likely it will be you will hear the change. So, all that being said, what is practical and what is useful? Some of these changes can’t be perceived by the human ear. Some can be perceived by an audiophile in a controlled environment. The truth is, almost no one can detect most of these changes while listening in their car, or while jogging, cleaning their house or tuning their car. You can’t use vinyl portably, so the limitations are very impractical in regular use. For those purists who sit in quiet rooms with the best equipment and the most highly controlled environment, know this, the recording is still imperfect, as is the playback equipment and all you are getting is a more perfect version of the flaws in the recording. If you want purity, you must go and listen to the musicians. If it’s recorded, it is flawed. Songs on the soundtrack of a PAL DVD will tend to be about 4% higher pitched than they are on record (or CD), because of the nature of PAL film and video transfers. I can tell you this. A 45rpm the music can be LOUDER than on a 33rpm. The sound wave is stretched out more at 45rpm so it is more shallow so there is more room to pump up the volume when recording it on the record. And then you need less amplification from the Stereo equipment for playback. Less amplification means better sound. Now, can we REALLY pick up on the differences? Who knows. BUT, there is a difference.